Certified & Insured Roofing Company. Fast & Cost Efficient Building Process. Warrantied Installation Plus Professional Clean Up. No Business Interruptions So You Can Keep Your Doors Open. TPO Roofing, known as an energy star rated eco-friendly flat roofing option. It's our priority to keep your business area clean, work fast and keep your investment warrantied. So you don't have any day to day interruptions of business. Looking for a Flat Roof? Traditionally flat roofs are the go-to style of roofing for commercial buildings, and just as the name suggests, the roofs themselves lay flat over the top of the building. Generally there are four types of flat roof, and each one generally runs around $600+ per square (100 square feet). Depending on manufacturer, each type classically comes with a 10 to 20 year warranty, and the average lifespan is between 20-25 years. When it comes to flat roofs, the most important thing to understand first is that pretty much all of the roofing systems use what’s referred to as “Membrane Roofing.” This simply means that a material (usually with a slight, almost unnoticeable slope) is used to move water off the roof. That’s why most flat roofing systems are going to be created using materials made of synthetic rubber, thermoplastic (PVC or like material) or modified bitumen. This membrane is made up of large and flat sections of synthetic rubber, with each piece bonded at the seam in order to create one large continuous membrane. EPDM (Ethylene Propylene Diene Monomer) is the preferred and most commonly used thermoset membrane. Holds up well to chemical cleaning applications, common in commercial roof maintenance. While similar to synthetic rubber (e.g. 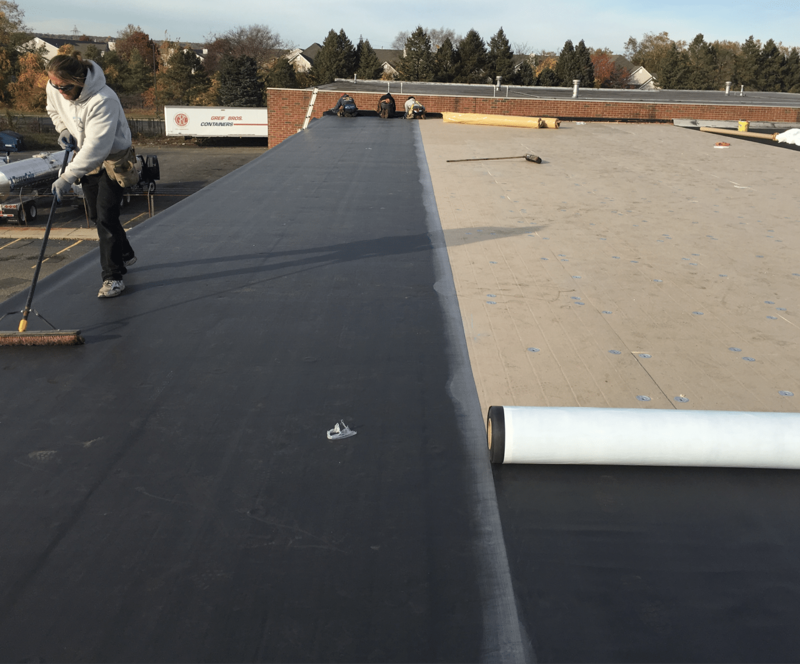 EPDM), one of the primary differences are that instead of gluing seams together, the seams are instead heat-fused (welded) together in order to create one long continuous section on the roof. “Lap” seams can also be fused with solvents instead of heat so that they are as strong as the rest of the membrane. Thermoplastics also include an additional reinforced layer to provide additional strength and stability. TPO (thermoplastic polyolefin) and PVC (polyvinyl chloride) are the two most common types of thermoplastic membranes. Modified Bitumen has a history that you could describe as an evolved form of asphalt roofing and is made by combining asphalt with a different rubbers and solvents. Here’s where it can get a little tricky, as Bitumen has a variety of different ways to bond the materials together including heat processes to melt together the asphalt (creating a seal), “hot-mopping” (similar to how classic built up roofs are installed) and cold applied glues or adhesives. If you’ve ever seen a roofer on top of a building using a blow-torch, they were installing a bitumen roof. However, one of the drawbacks of a modified bitumen roof is an increase in insurance related costs because heat fusing via blow torch is required. Why is EPDM, TPO or Modified Bitumen Recommended for a flat roof? 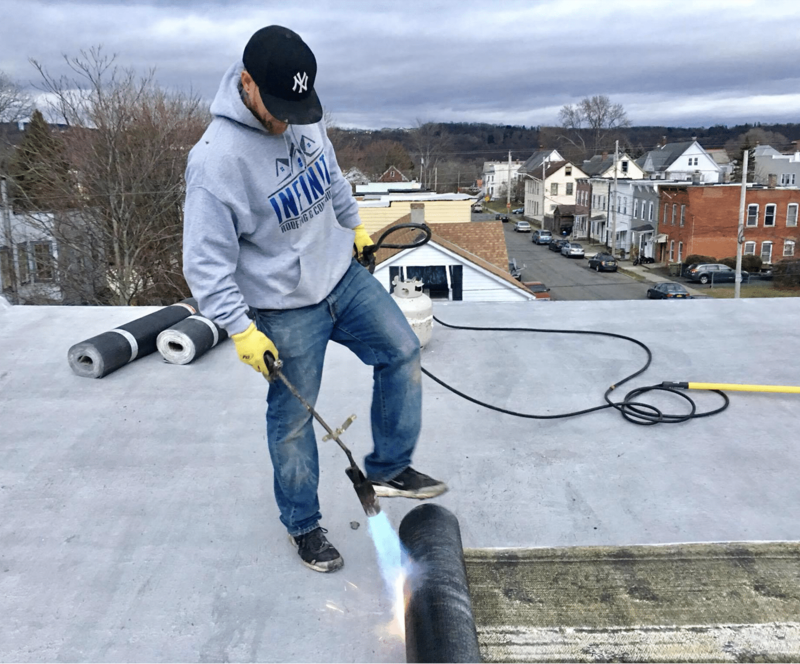 The traditional method of flat roofing was called “BUR” or built-up roof, which involved alternating layers of asphalt and water-proof materials, and then topping the finished product with gravel. 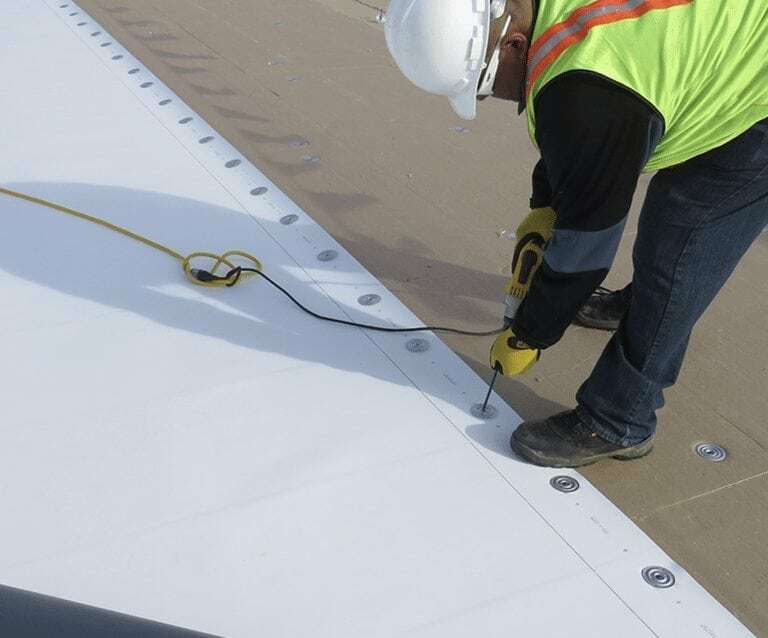 This method is very difficult to create a uniformed, proper seal across the entire roof at every single seam and connection, which meant that the roof’s leaked earlier on during the lifespan of the roof and consequently this also meant that the roof required significantly more maintenance. Repairs also caused problems because it can be hard to spot the exact source of the leak. Each of the new methods of flat roofing, when correctly installed either have no seams or each seam is just as strong as the body of the roof, eliminating leakage issues altogether or at the very least making it extremely easy to pinpoint the exact area where there is a break causing a leak. Traditional Built Up Roof’s required gravel on top of the asphalt because asphalt exposed to direct sunlight constantly (as roofs are, all day, every day) causes the roof to go bad much faster because of expansion and contraction from heat and cool cycles AND UV rays from the sun would damage the exposed asphalt. Plus, the asphalt literally needs weight on top of it to “hold it in place” because the asphalt is only “sitting” on top of the roof and isn’t directly attached to the building.